I have an established knock-out rose that has done wonderful for years. I have 3 more growing in the same area. They receive the same amount of light and water. One is looking terrible. It looks as though it is dying. Thanks for any help you may give me. That one rose may have a boring insect getting at it, a close up investigation is needed to see if there is any such damage. Also, dig down towards its roots a bit in one area to see how things look, do so carefully though. It could also just be that particular bush. 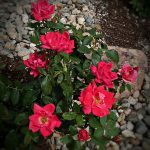 Over the years I have had a few that just do not seem to have the same will to live and thrive that the others do, even though they may be the exact same type of rosebush. Check the soils moisture and make sure it is not getting shaded somehow so as not to get the sunshine she needs.